In hospitals, urgent care, long-term care and other healthcare facilities, immobile patients make complete evacuation in the case of a fire difficult or impossible. For this reason, containing fire through built-in or passive fire protection in tandem with active fire protection measures is crucial in health care occupancies. In addition, research shows that adding natural light in healthcare interiors leads to healthier outcomes. Todays clear fire rated glazing products play a key role in providing patients both fire safety and light in new and renovated healthcare facilities. Clear glazing in healthcare occupancies is healthy for patients and workers. In 2006, The Center for Health Design published a report finding that By controlling the bodys circadian system, light impacts outcomes in healthcare settings by reducing depression among patients, decreasing length of stay in hospitals, improving sleep and circadian rhythm, lessening agitation among dementia patients, easing pain, and improving adjustment to night-shift work among staff.â€ The study concluded that adequate and appropriate exposure to light is critical for health and well-being of patients and staff in healthcare settings. Natural light is not only healthy, it’s green because it reduces the need for artificial light and energy use. Total building fire protection for life safety is more necessary in healthcare occupancies than other occupancies, because of the nature of the occupants, says NFPA Technical Committee member Daniel O’Connor. FM Global has created a video that lays out some of the reasons that sprinklers fail and why sprinklered buildings burn. In 2010, the National Fire Protection Association (NFPA), an enthusiastic sprinkler system advocate, published a report called U.S. Experience with Sprinklers and Other Automatic Fire Extinguishing Equipment. NFPA research found that when sprinklers are present in the fire area, they operate in only 93% of all reported structure fires. 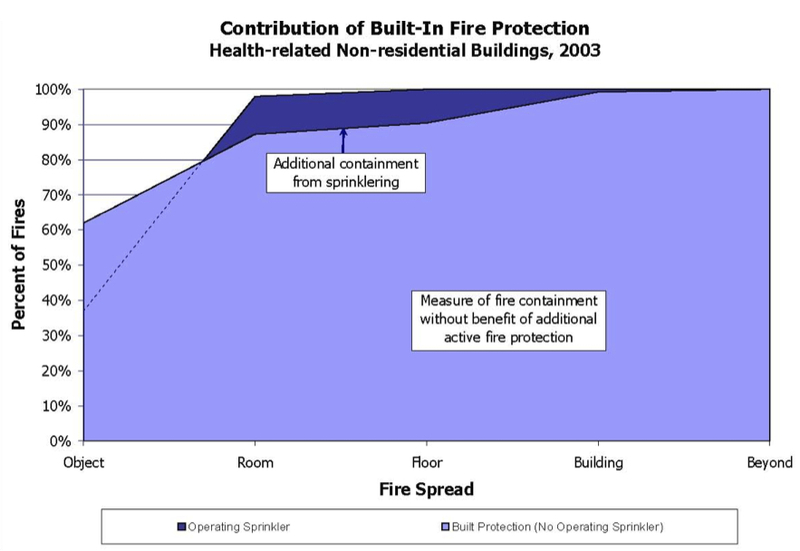 According to the NFPA, when sprinklers fail to operate, the reason most often given (53% of the failures) was shutoff of the system before the fire started, which may occur in the course of routine inspection and maintenance. Other leading reasons for sprinkler failure include: an inappropriate system for the type of fire (20%); lack of maintenance (15%); and manual intervention that defeated the system (9%). Given the margin of sprinkler failure, every fire protection strategy for a healthcare facility should incorporated an alternate means of built-in or passive fire protection in order to avoid dire consequences for both patients and workers. Fire rated glazing provides continuous passive fire protection without the need for triggers that require maintenance and are at risk of not working in an emergency. In addition, incorporating clear lines of sight through transparent walls, doors and openings is a significant benefit to first responders. It gives them an opportunity to visually assess the situation before charging in, greatly improving fire and life safety. Here are some guidelines for the types and sizes of fire rated glass and framing to use in healthcare settings to meet applicable codes and create built-in fire protection for patients, staff and visitors. 1-hour exit/stairwell enclosures – 60 min. door vision panel and 60 min. sidelites, transoms and other openings. 60 min. fire protective glazing can be used in the door vision panel up to 100 sq. in. To exceed 100 sq. in. in door vision panels, 60 min. fire resistive glazing is used. 60 min. fire resistive glazing must be used in the sidelites, transoms and openings. 2-hour exit/stairwell enclosures – 90 min. door vision panel and 120 min. sidelites, transoms and other openings. 90 min. fire protective glazing can be used in the door vision panel up to 100 sq. in. To exceed 100 sq. in, 90 min. fire resistive glazing is used. 120 min. fire resistive glazing must be used in the sidelites, transoms and openings. 1-hour exterior walls – (when permitted per Table 705.8 in the IBC) 45 min. fire protective openings within specified limits. To exceed specified limits, 60 min. fire resistive glazing must be used. 2-hour exterior walls – (when permitted per Table 705.8 in the IBC) 90. min fire protective openings within specified limits. To exceed specified limits, 120 min. fire resistive glazing must be used. For a complete list of fire rated glazing applications, please refer to Tables 716.3, 716.5 and 716.6 of the 2012 IBC. Click here to see a gallery of fire rated glazing installed in healthcare occupancies. SAFTI FIRST also offers an AIA-registered live webinar explaining the updated 2012 Chapter 7 Tables in depth (eligible for 1 AIA LU/HSW credit.) To schedule a free webinar for your firm, please contact Diana San Diego at dianas@safti.com.